Holiday Giveaway With WH Hostess! It's hard to believe that Thanksgiving is just around the corner and that fall is coming to an end. If you are hosting Thanksgiving dinner at your home this year, here is a simple and modern way to dress up your doorstep (or anywhere else in the house that needs last minute fall decor). Gather your supplies: pumpkin, railheads, a pencil and decorative ribbon. Think about your design before you draw it on the pumpkin. Draw your pattern onto the pumpkin (you could use a stencil too). Once your design is drawn on the pumpkin, start inserting the railheads one by one. Finish up your design or letter and there you go! You have a modern update to a traditional pumpkin! 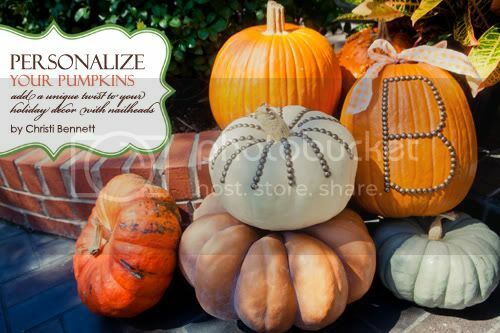 You can use railheads on any type of gourd - not just a pumpkin! A big thank you to Kelly Lyden of The Party Dress for featuring my DIY tutorial in the latest issue of her magazine! Love this DIY that I can actually do! FOR BEST COLLECTION OF VALENTINE DAY PARTY IDEAS. The decoration part was just superb. It makes the party super rocking. There are many new instances when individuals fail to arrange all new things and entertainment aspects for their special event due to Vaughan wedding venue lack of spec and proper resources. To overcome all such problems here is something new and exciting for you all, make sure you hire our Vaughan banquet hall services and we will make it special in all new ways. Thanks for sharing your informative post. Thanks for the step by step process. I like your approach towards the whole thing. How are we supposed to do it. There literally are no images.